450sq feet of space including additional pull-out sofa for added comfort. Two queen beds complete with our Hypnos beds topped off with crispy Eden linens and duvet. 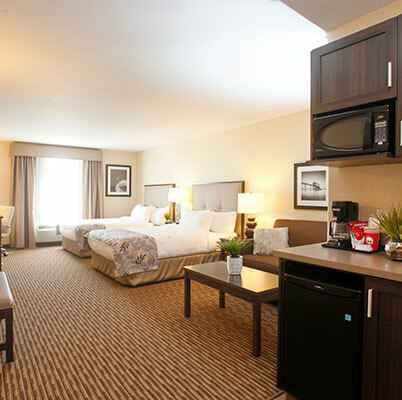 Stay entertain with free WiFi and a 39” HDTV. A Keurig coffee station will brew that perfect cup of coffee to kick start your day. 400sq ft of comfort with a Hypnos pillow top mattress finished in crispy Eden linen and duvet. Our accessibility suite features a spacious bathroom complete with a roll in shower, lowered sink, counter top and shelving. 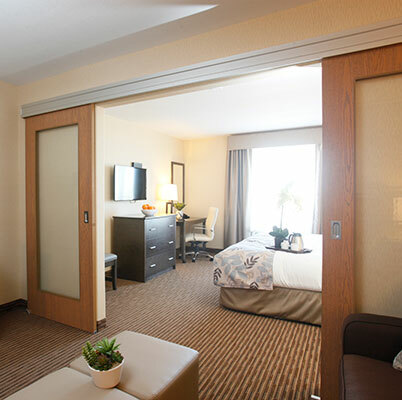 Stay productive & entertained with complimentary WiFi and a 42” flat HDTV. 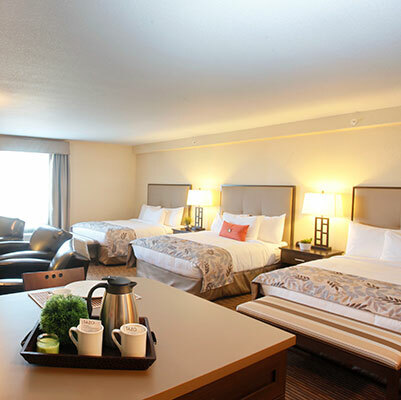 Enjoy close to 450 sq ft of comfort with two king size Hypnos pillow top beds. Stay connected and entertain with free WiFi and a 39” HDTV with high definition channels. A Keurig coffee station will brew that perfect cup of coffee to kick start your day. 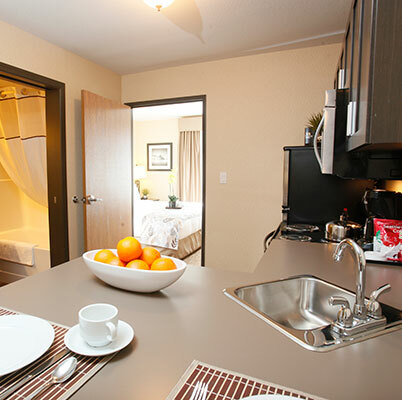 Enjoy 450sq feet of space including fully equipped demi kitchen. Two queen beds complete with our Hypnos beds topped off with crispy Eden linens and duvet. 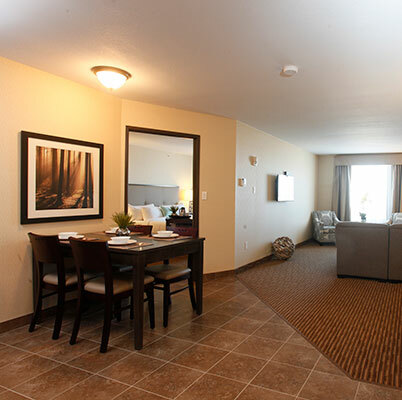 Stay entertain with free WiFi and a 39” HDTV. A Keurig coffee station will brew that perfect cup of coffee to kick start your day. 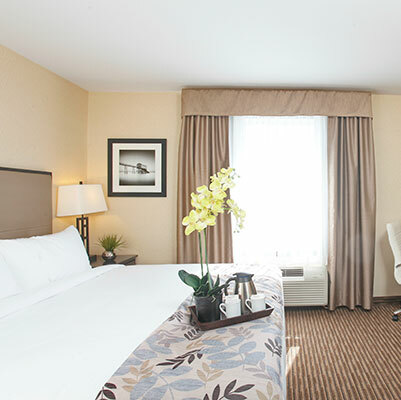 Deluxe well-appointed King Suite with double pull-out sofa in the spacious living area. 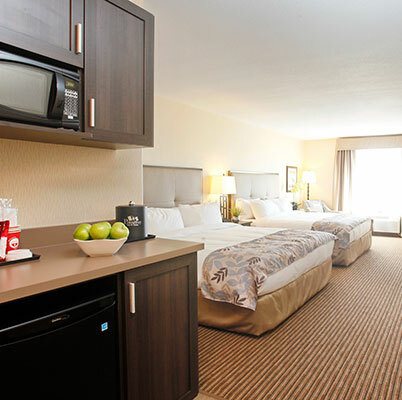 Stay entertain and connected with free WiFi and a 39” HDTV with our Shaw direct premium package. A Keurig coffee station will brew that perfect cup of coffee to kick start your day. 500sq feet of living space including a fully equipped kitchen. Two queen size Hypnos beds topped with crispy Eden linen and plush duvet are separated by a wall divider for that extra privacy and comfort. Stay connected and entertain with free WiFi and a 39” HDTV. 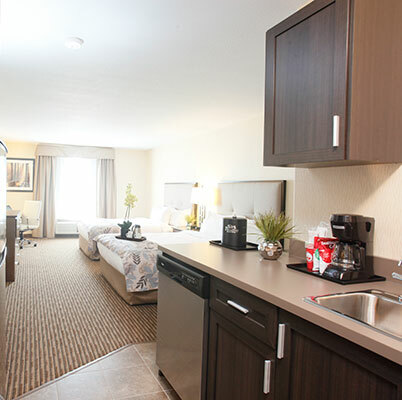 Spacious Suite with full kitchen offers 480sq ft of living space. This one bedroom suite features a king size bed and well-appointed living area with a double size pull-out sofa bed and electric fireplace. Complimented by a fully equipped kitchen, bar and high stools to enjoy that perfect meal. Large living area with three bedrooms; ideal for families with one king sized bedroom, a queen sized bedroom and a separate double bedded room. Living area features a double pull-out sofa bed and fireplace. Complimented by a fully equipped kitchen, bar and high stools to enjoy that perfect meal. Spacious room with three Hypnos pillow top mattresses, topped off with crispy Eden linens and duvet, ideal for larger families. 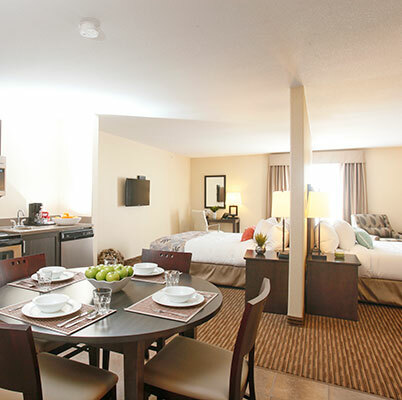 A fully equipped kitchen with stainless steel appliances will provide that extra comfort and freedom during your stay. 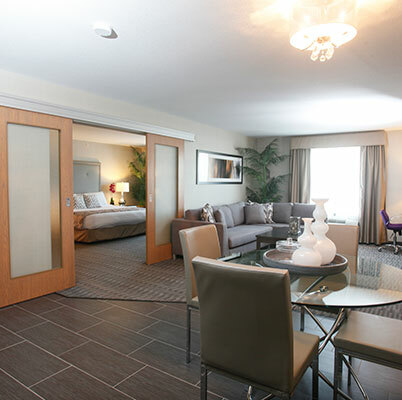 Deluxe Suite offers 700sq ft of functional space with double size pull-out sofa and electric fireplace. The demi kitchen features a fridge, range top, microwave and dishwasher - complimented by a bar with high stools. Did we mention the Jacuzzi bath has a large free standing two person shower?